Legoland’s Gone A Bit Spooky! 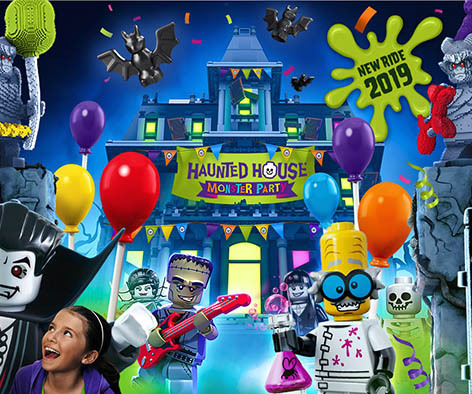 Something spooky is happening at LEGOLAND Windsor! It’s the start of a new season at the UK’s favourite family park and there’s hype about the latest new attraction – ‘Haunted House Monster Party’. Opening on Saturday 13th April Lord Vampyre invites you, and all the little monsters to the best ride ever! We don’t want to ruin the surprise for you but hold on to your hat’s folks, things are going a bit topsy-turvy! As well as the exciting new rides and attractions, LEGOLAND Windsor also boasts some great classics for all age groups. Under 3’s can enjoy the DUPLO Train & Valley Airport. 3-5 year old’s can ride the Dragon’s apprentice coaster or put their L-plates on and drive their own electric car and receive a certificate afterwards! 6-13 year olds can try out the twists and turns of The Dragon rollercoaster or set sail on the Viking River Splash through uncharted territory! There’s loads going on!! Did you know we’re just 9 miles away from LEGOLAND which in good traffic takes just 18 minutes! So book your tickets with LEGOLAND Windsor here, then book your family room at The Thames Riviera Hotel by clicking here.